The memoir Bill Cosby might have written if he were a clever Jewish girl from suburban New Jersey sent to summer camp in the Maine woods. A brand-new teenager in 1974, humorist Schneider spent eight weeks at kosher Camp Kin-a-Hurra (a seemingly Native-American term that’s actually Yiddish for “may no evil find you”). It was a dump, run by an amiable hustler who had added nothing to the ramshackle enterprise since he founded it in 1922. There the young captive Mindy mouthed age-old folk songs with campmates Dana Bleckman, Betty Gilbert, Borscha Belyavsky and Autumn Evening Schwartz. The quick-witted girls played softball indifferently, hiked ineptly, baked challa and frequently visited the boys’ encampment across the filthy lake. Goofy parents showed up, much to their progeny’s mortification. Mindy Plotke sprained her ankle on a mountain trail. 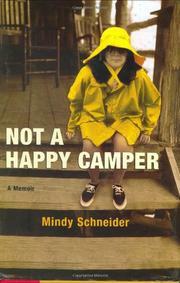 Mindy Schneider’s long-term goal was to become popular and famous. Her short-term goal: getting popular and getting a boyfriend. Would it be Kenny Uber or Phillip Selig? At summer’s end, who would bestow her first kiss? The author winsomely recalls sleep-away dreams, growing into a training bra, struggling to control inconvenient rashes and awkward hormones. She punctuates her droll entertainment with references to junk food and TV staples of a generation ago, embellished with songs and snapshots from old Kin-a-Hurra. A sweetly humorous fugitive from the Young Adult category, playing dress-up for nostalgic adults.